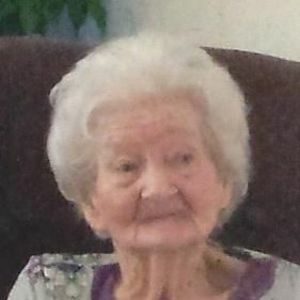 GREENVILLE- Daisy Lorine Crick, 94, of Greenville died Saturday, September 5, 2015 at her residence. She was born April 26, 1921 in Hopkins County. She retired from Owensboro Health Muhlenberg Community Hospital as a housekeeper. She was a member of New Life Church. Ms. Crick was preceded in death by her husband, Claude Crick; daughters, Delema Simms and Ella Mae Gray. Survivors include her sons, Claude E. (Linda) Crick of Louisville, Larry (Norma) Crick of Graham; daughters, Vickie Groves of Greenville, Anna Jo (Allen) Brock of Central City, Wanda Crick of Greenville; 17 grandchildren; 32 great-grandchildren; 27 great-great grandchildren; 4 great-great-great grandchildren. Funeral services will be Tuesday, September 8, 2015 at 11:00 AM at Tucker Funeral Home in Central City with Rev. Wayne Rice officiating. Burial will be in Lee Hill Cemetery. Visitation will be Monday, September 7, 2015 from 5:00-8:00 PM at the funeral home. Online condolences can be made at www.tuckerfuneralhomes.com. Truely a special lady, whom has been in my life since I was a young teenager. She was a blessing to me in many ways down through life.Ms.Crick loved alot of people and I'm so glad I was one of them. I so loved Mr. & Mrs Crick very much and am certian both of them are greately missed. But I am so happy to know that they are both together once again. Happy that I know Claude was waiting there for Ms. Daisy and that they will spend an eturnity together, never to be apart again. Aspecial hug goes out to Vickie Groves , my friend for all she has done to keep Ms. Daisy at home. I care deeply for you girl and hugsss to the whole FAMILY. You are in my thoughts daily. Jo and Elizabeth our heart felt sympathy goes out to you and all the family. Vickie, I am so sorry to hear of your loss.... It is so hard to lose your Mother... Know that I am praying for you and the family.... You are a dear friend and I thank God for you having been in my life... If I can do anything for you, just call.. Thanks for all you have done for me in the past..